I’ve had this in the “hopper” for a while now. A while ago, I caught a Lifehacker article extoling the virtues of the “full in, full out” strategy. I then read the original article about productivity, cleaning, and decluttering that included the strategy, among others. The general principle is that as you move from room to room in your house, try to bring with you the items from the starting room that belong in the rooms along your travel path. 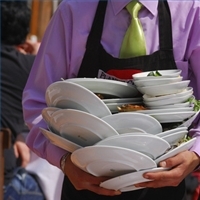 Apparently, the concept comes from the restaurant industry: when going into the kitchen, bring empty, dirty dishes in and new, full dishes out. So that your arms are full on the way in and on the way out; very efficient. The problem I’ve run into in trying to implement it has been an excess of thought into every move I make through my house. And then an excess of self-criticism once I get somewhere and realize what I could have brought with me. But I think once I get over some of the initial hurdles, and accept that I can’t or don’t have to do it all the time, it will become more natural. The other strategy that I really liked in the Parenting Squad article was to “keep one room sacred”. That is, maintain one room as a kind of sanctuary, where you can escape whatever else is going on. I like that. This entry was posted in Opinion and tagged productivity.